Le Cirque des Reves is only open from dusk til dawn, and is filled with black and white tents housing illusions and acts that defy imagination. There’s a wishing tree, a cloud maze, a contortionist, a fortune teller, and the illusionist, a young woman who can change the color of her hair while you watch. This mystical, magical circus provides the board for a game of wits, for lack of a better term, between Celia, that young illusionist, and Marco, the circus’ manager. From the time they were children, Marco and Celia’s “caretakers” enter them into a sort of magician’s competition. As they grow, both Marco and Celia are trained for this competition though they are never told when it will take place or how a victor is declared. This is the basic premise of Erin Morgenstern’s much buzzed debut novel, The Night Circus, and beyond that premise you’re not going to find much more than loads and loads and loads and then a few more loads of description. If you’re the type of reader who eats up these kinds of minute details and begs for more, run out and grab this one. If you’re the type of reader who thrives on character growth and development, approach with extreme caution. 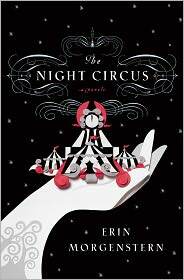 A latter type myself, initially I found Morgenstern’s excruciatingly detailed descriptions of the circus tents and the wonders inside enthralling but soon grew bored with all the fluff that seemed outside of the actual story. I wanted to know about Celia and Marco and how they felt about this macabre competition, and how/why they fell in love. The dueling illusionists meet once, on a rainy street in Prague, and the next thing you know they’re in love. I wanted to know why Celia’s father, a great illusionist himself, and Marco’s mysterious benefactor dreamed up this entire competition and why the participants never rebelled or refused to play along despite the deadly stakes. However, despite the holes in the story, the circus is still pretty captivating. Even though I bellyached about all the detailed descriptions of the tents, I loved learning about the inner workings of the circus and how Celia and Marco used their skills (or powers, which doesn’t feel right) to keep things running and safe. What I really liked here, and what kept me slogging through the mountains of description, were the flame-haired twins, Poppet and Widget, born the very first night the circus opens and have a strong connection to it and the magic it holds. Whenever Poppet and Widget were front and center, I was a happy reader. Oh, I also loved that the circus develops a sort of deadheadesque cult following who call themselves the Reveurs. But to get to these bits of goodness you have to wade through so much description it borders on masturbatory and a lot of pointless characters. It’s as though the author was creating an illusion herself, trying to distract the reader with beautiful images hoping nobody would notice that the story is full of holes and most of the characters serve no real purpose. And I ate up the details, but I also didn’t think there was too many. Isn’t that interesting? I love hearing how other people view books I like. I think the detail thing is a matter of preference. . . you know, like Coke vs Pepsi. Too many details (obviously) bore me, and that’s what keeps me away from a lot of SciFi and other genre-type things. Often genre stories get mired in describing the world and don’t get around to the characters and what motivates them. It sometimes feels like the writers fall a little in love with the world they created and forget about the people who populate it.